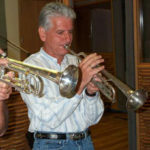 Jerry Hey is an American trumpeter, flugelhornist, horn arranger, string arranger, orchestrator and session musician who has played on hundreds of commercial recordings, including Thriller and the distinctive flugelhorn solo on Dan Fogelberg’s hit “Longer”. Jerry Hey was born in Dixon, Illinois, in 1950, to parents well known in the area for their involvement in music. He attended the National Music Camp for two summers. While in college, Hey studied under Bill Adam at Indiana University. He composed and arranged the song “Jedi Rocks” for the 1997 Special Edition re-release of Return of the Jedi. He co-produced four songs on Lisa Stansfield’s 2014 album, Seven.